On college campuses everywhere, students can be seen kicking around a colorful, small, leather ball stuffed with plastic pellets. The Hacky Sack was invented in 1972 when John Stalberger met Mike Marshall and observed him kicking around a handmade beanbag. Stalberger believed the beanbag would be beneficial as physical therapy for his football-injured knee and began using it. The two created a game called Hack the Sack in which they kicked the beanbag back and forth without it hitting the ground. 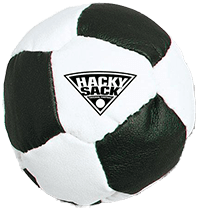 Seeing the potential appeal of the game, they trademarked the name “Hacky Sack” and began marketing the toy across the United States. Marshall died of a heart attack in 1975 at the age of 28 but Stalberger moved forward and formed the National Hacky Sack Association which established official rules and helped to control the growth of the fledgling sport. In 1983, Stalberger sold the rights to the Hacky Sack to the Wham-o Manufacturing Company and the popularity of the toy exploded. 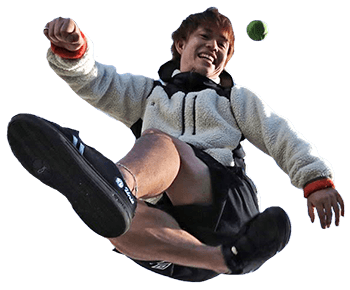 Aided by the National Hacky Sack Association, the game evolved into an official sport called footbag. Combining elements of volleyball, tennis and badminton, players attempted to kick the ball back and forth over a five-foot high net. A variation of the original concept of Hacky Sack (which many called Freestyle Footbag) remained popular as performers kicked the ball in the air accompanied by background music and choreographed different tricks and maneuvers. An official rules committee has been developed (the International Footbag Committee) to govern the competitive sport. As players of Hacky Sack attempt to keep the ball off the ground by using their knees and feet, certain competitions are held to see who can do so the best. The world record holder for consecutive “kicks,” kicked the sack 63,326 in eight hours, fifty minutes and forty two seconds on June 14, 1997. Hacky Sack competitions continue as does the game’s popularity. Perhaps its acclaim is due to the comedy that accompanies the attempts to keep the small beanbag in the air, or perhaps it is just another pleasurable way to waste away the day.